The Air Source Heat Pump Training Rig is a mobile teaching aid which demonstrates how an air water heat pump system functions. Using the air source heat pump as the energy supplier, once switched on, the heat pump very quickly heats up the water within the radiator and heat exchanger coils. The rig can be used as an excellent sales aid as the rapid rise in temperature of the radiator and cylinder heat exchanger clearly illustrates the possibilities of Air Source Heat Pumps. 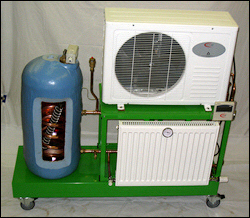 The Air Source Heat Pump is used to heat a small radiator on the front of the rig. The display cylinder is cut away to expose the inner heating coils. The rig also shows how a basic cylinder can be retrofitted with a SolaPlug (scaled down) to utilize heat generated by solar panels. Temperature gauges indicate rise and fall in temperature at radiator and coil. There is an air vent within the body of the heat pump to facilitate removal of any air pockets after the system is filled. This can be accessed via a small cover at the rear of the unit. 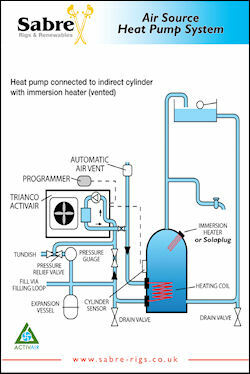 The mobile training rig incorporates a second automatic air vent situated between pump and cylinder. The system incorporates filling and flushing points and 2 metre mains cable. The training rig is mounted on a light weight powder-coated steel frame fitted with large lockable wheels for ease of mobility within training centres. The Air Source Heat Pump is based on latest compressor technology and incorporates a digital remote programmer, circulating pump and anti-frost technology. The Rig itself is compact for storage and fits easily through most doorways. A high quality washable Foamex board for use as a training aid in training & assessment centres.